Arriving at Algeciras, Spain. 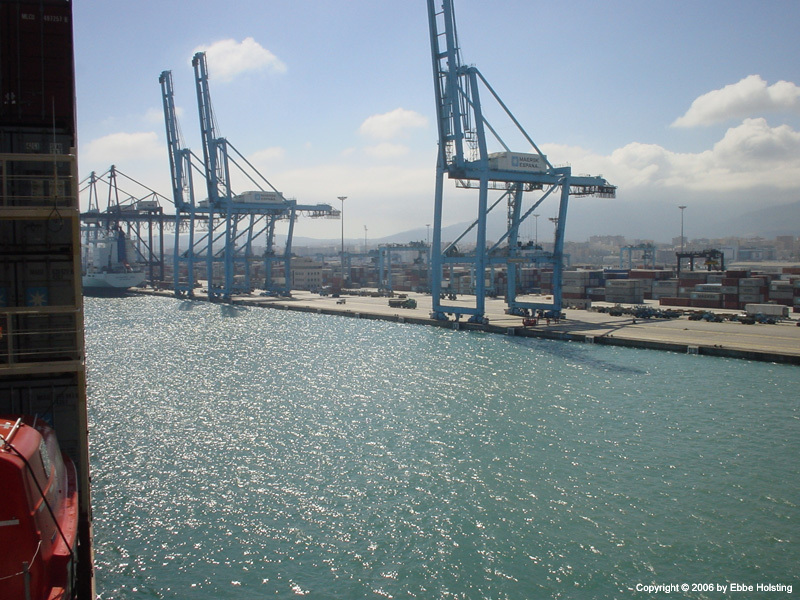 The container terminal in Algeciras is owned by Maersk, and is arguably the most important transit hub in the Maersk Line route network. Note that the booms on the cranes on the pier (gantry cranes) are tilted upwards allowing the ship's accommodation to pass underneath. 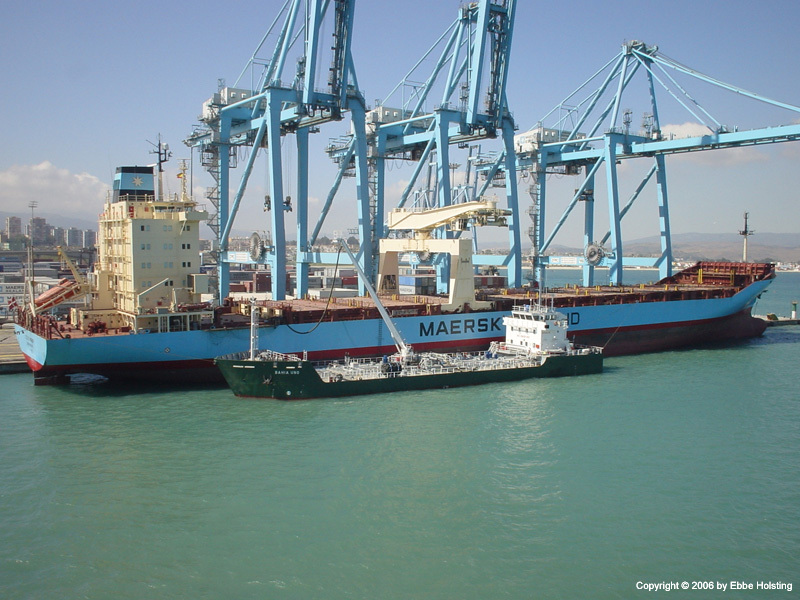 The smaller container vessel Cecilie Maersk berthed at Algeciras. 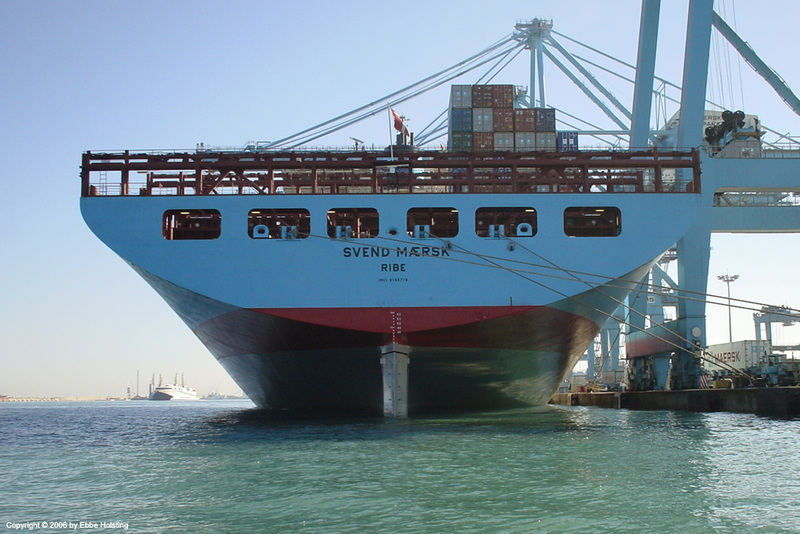 Cecilie Maersk, together with the other C-class Maersk Line container ships served the west coast of Africa and southern Europe at the time. Berthed alongside Cecilie Maersk you see a so-called bunker barge, a small tanker carrying oil for refueling (bunkering). 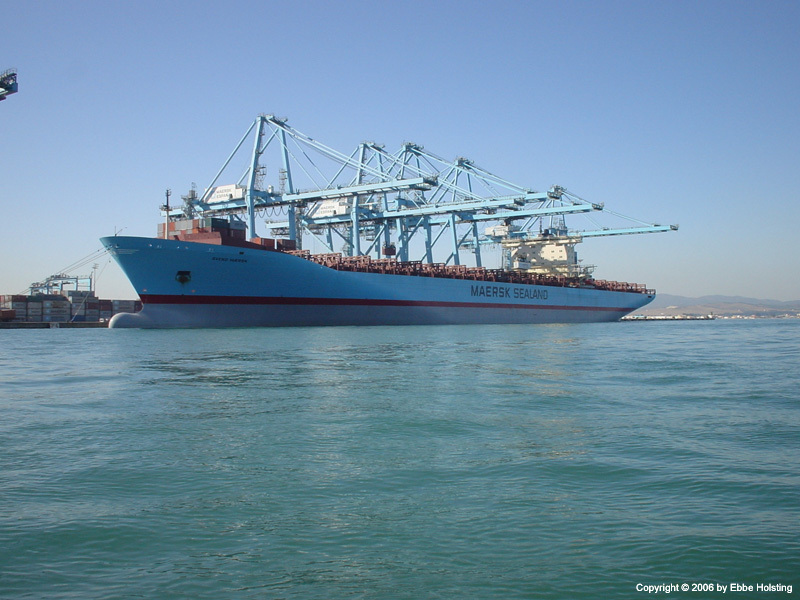 Svend Maersk as seen from the sea side while berthed at Algeciras. The picture is taken from the ship's MOB boat (Man Over Board boat), which was launched at Algeciras for a monthly test and inspection. 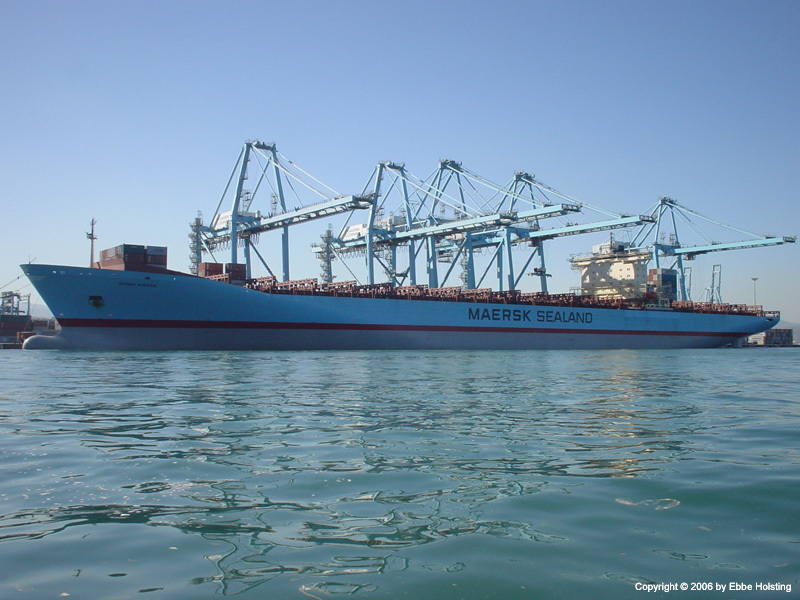 Algeciras is one of Maersk Line's most important container terminals, and we always had a lot of cargo for this port, which explains why there are so few containers on the deck of Svend Maersk. 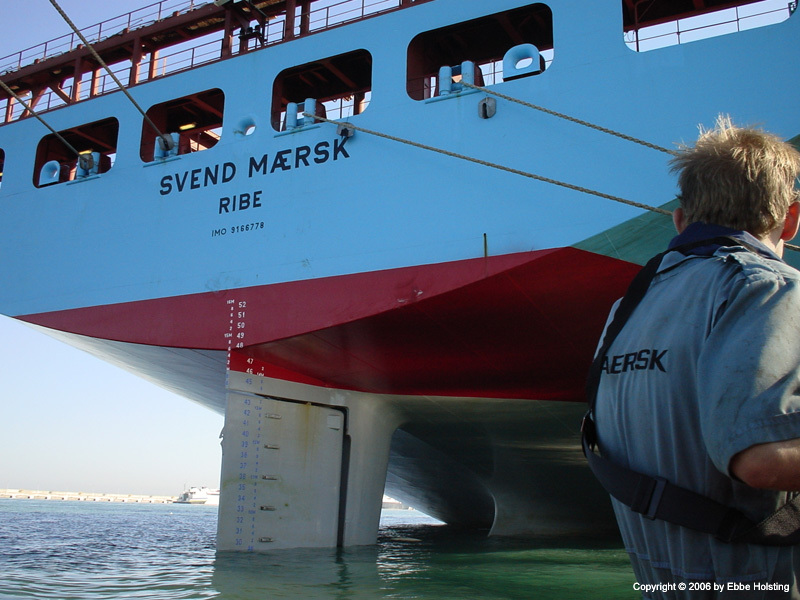 The mighty rudder of the Svend Maersk. Note the draught marks, the large numbers being the ship's draft in feet, and the smaller ones indicating the draft in meters. For steering the ship, the rudder is turned by a huge hydraulic arrangement called the "steering gear". A view of the stern. Under the ship's name is the name of the Port of Registry, in this case the Danish city of Ribe. Under this, you see the vessel's official IMO number issued by the International Maritime Organisation (IMO) for identification purposes. If a ship is sold to new owners the name is often changed, but the IMO number is always the same and follows the ship for it's entire life. Viewing the "transom", i.e. the aft most vertical steel plating. The Svend Maersk and her sister vessels are equipped with a radar aft, visible just below the flag. This radar gives a better view of the area behind the ship than the radar scanners mounted on the top of the accommodation, and it is mostly used for anti-piracy measures in the Gulf of Aden and in other places where a risk of piracy excists. Ongoing cargo loading / discharging operations while berthed at Algeciras. Note the ship's cargo hold hatches stacked behind the cranes. 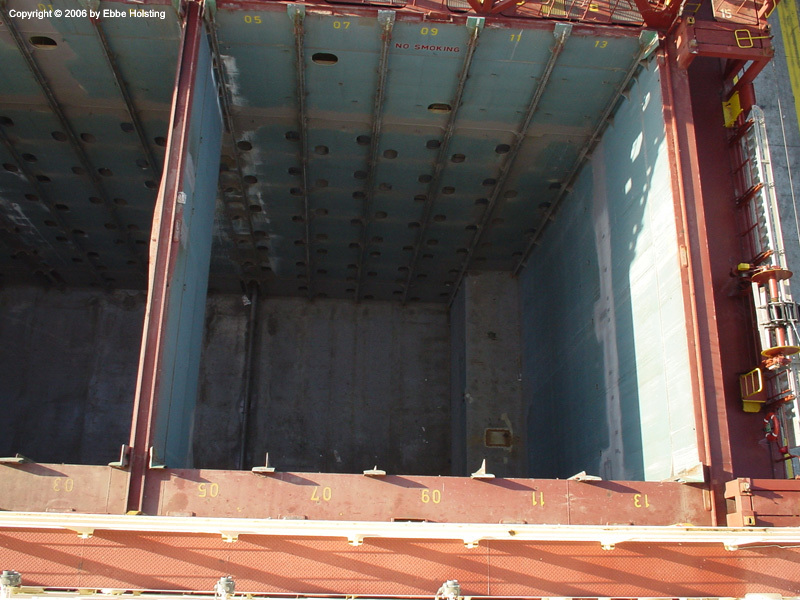 The cranes lift off these hatches for access to the cargo holds. 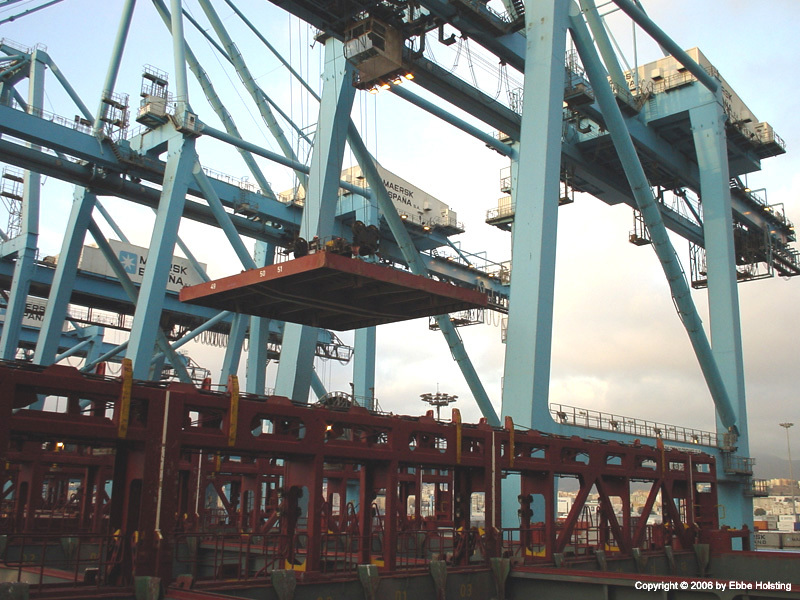 A hatch cover being lifted off the ship by one of the gantry cranes. 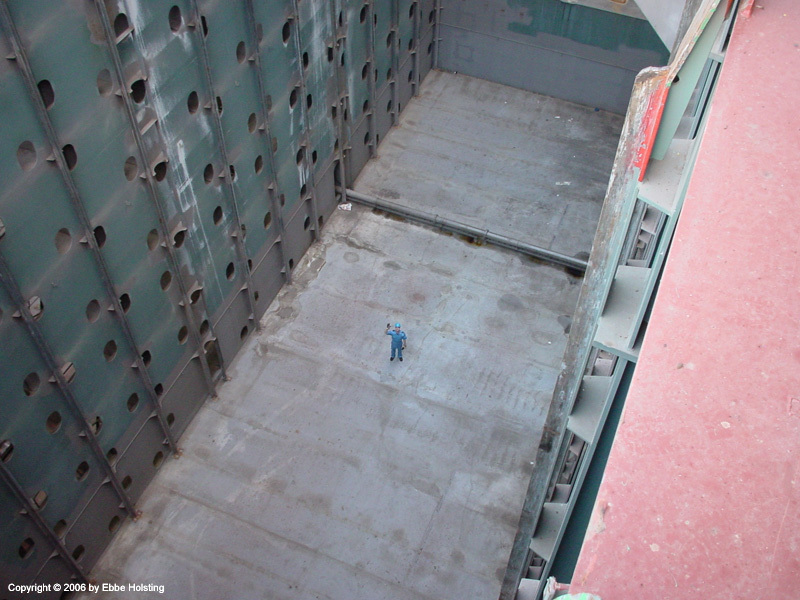 The hatch covers weigh about 30 metric tons each! 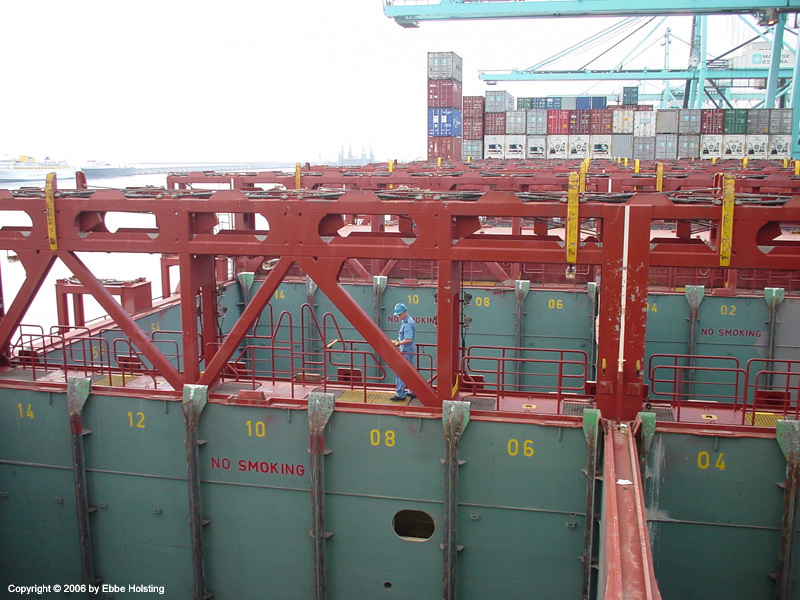 Below the hatch, in the foreground, you see a lashing bridge, from where the containers stacked on deck are lashed. The lashing bridges also enables the ship's electricians to maintain their daily supervision of the reefer (cooling) containers. 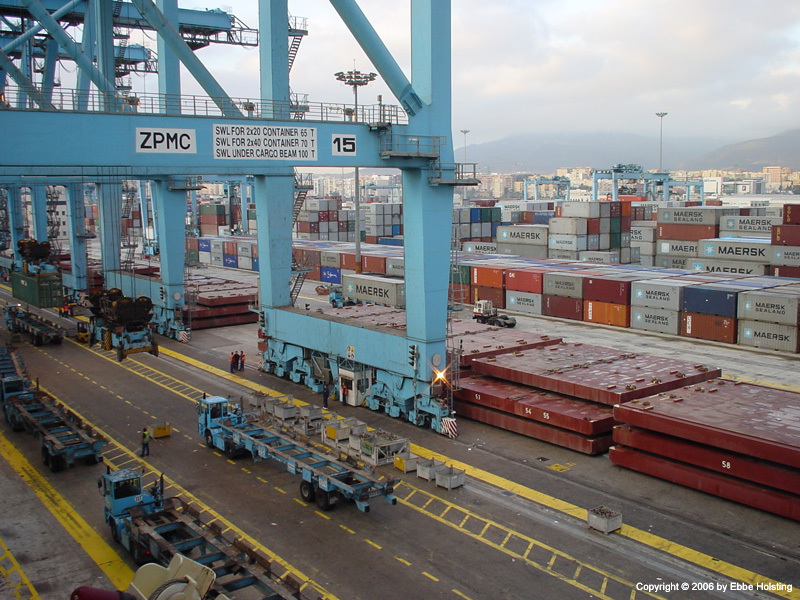 With Algeciras being one of the most important container hubs the ship was often unloaded almost completely at this port. This picture gives a good idea of what a container vessel actually is: a rectagular, empty box. Between the rows of cargo holds we see the lashing bridges once again. The yellow numbers painted on the bulkheads of the cargo holds indicate the row numbers. 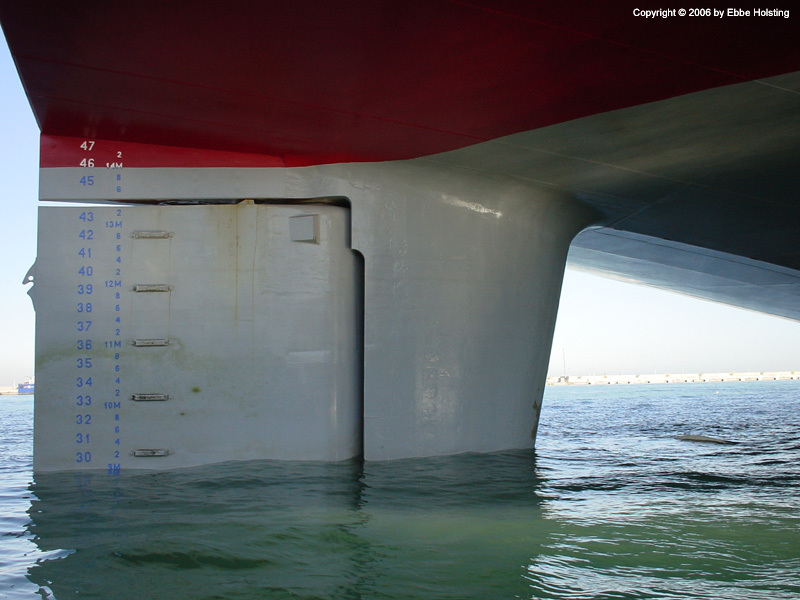 Together with the bay (hatch) number and tier (vertical row) number, each container onboard a container vessel has a unique stowage position identified by a six-digit number. For instance, position 321006 indicates bay 32, row 10, tier 06. This allows for quick and easy location of any container. The aft end of an empty cargo hold. 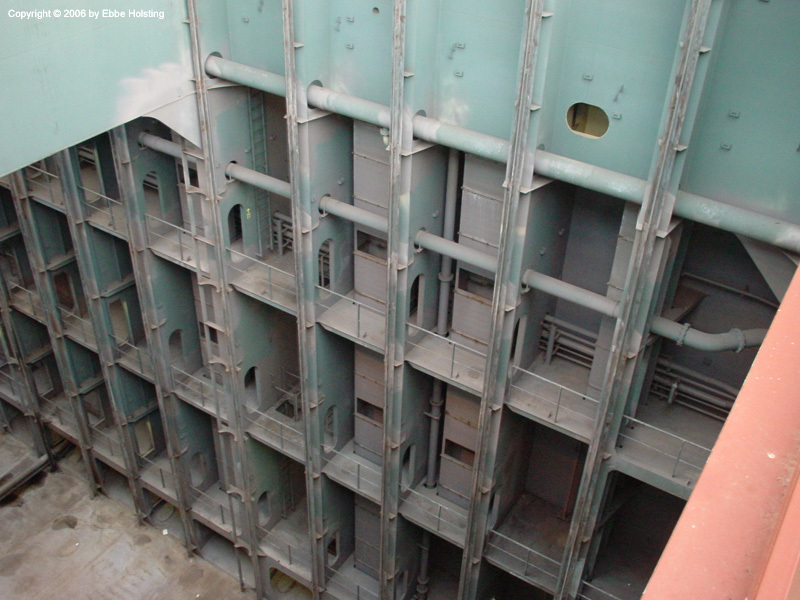 The vertical rectangular "boxes" are the cargo hold ventilation shafts. Reefer containers need air for cooling purposes, so all cargo holds are mechanically ventilated. 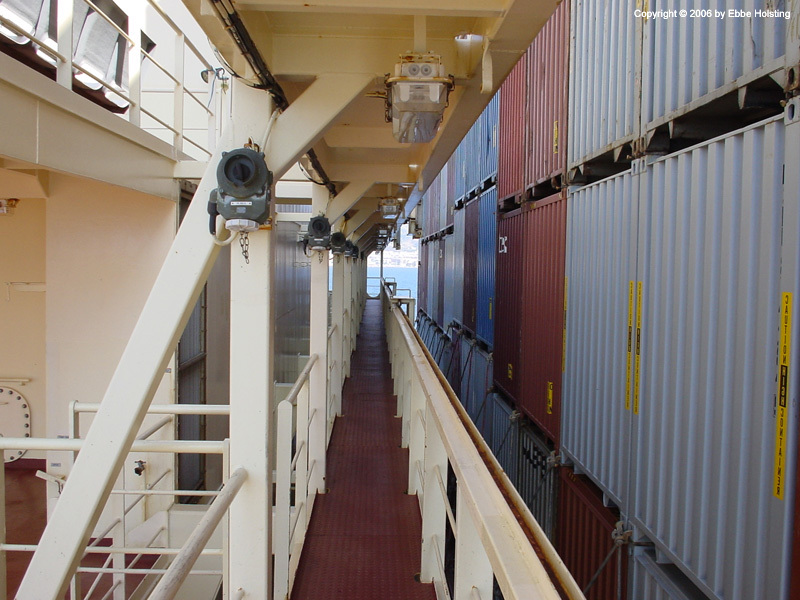 The vertical bars going from top to bottom are the "cell guides", in which the containers fit perfectly, preventing any movement of the containers whilst at sea. My fellow cadet Hasse standing on the bottom of an empty 40 foot cargo hold. The cargo holds are paired two and two, and each pair is separated from the pairs fore and aft of it by means of a water tight bulkhead. This way the ship is divided into a number of water tight compartments. Another picture showing the cell guides. Below the bottom of the cargo hold there are fuel oil tanks and water ballast tanks. 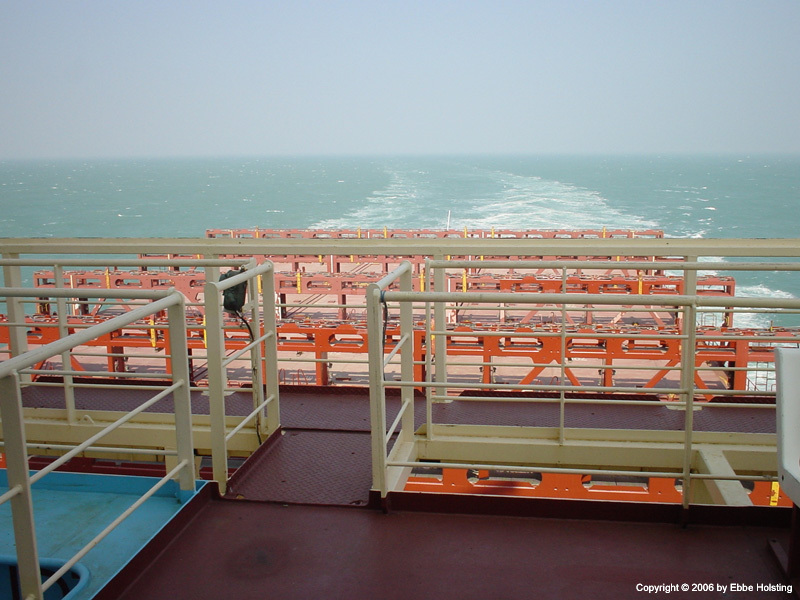 Ballast tanks are used to improve the ship's stability as well as reduce stress and other forces on the ship's hull. 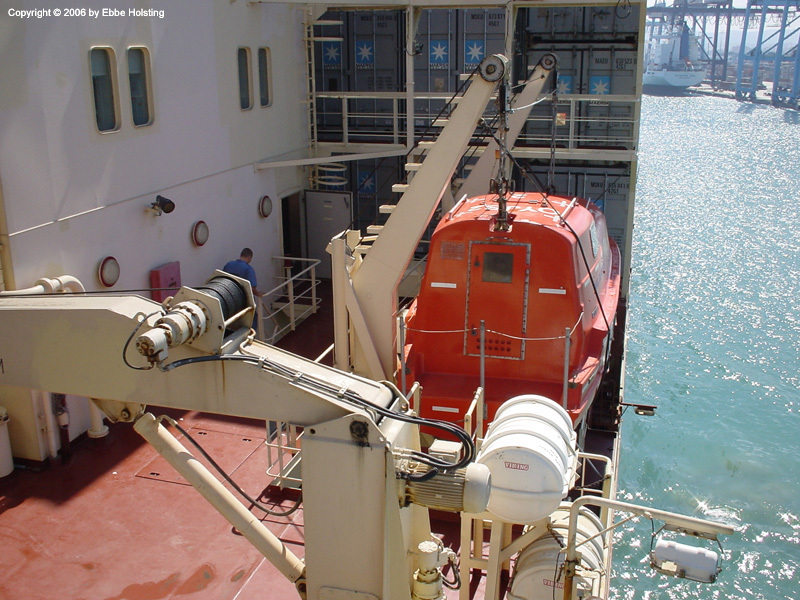 Ballast water can be pumped in and out of these tanks to compensate for varying cargo weight and distribution. Hasse still waving at me. 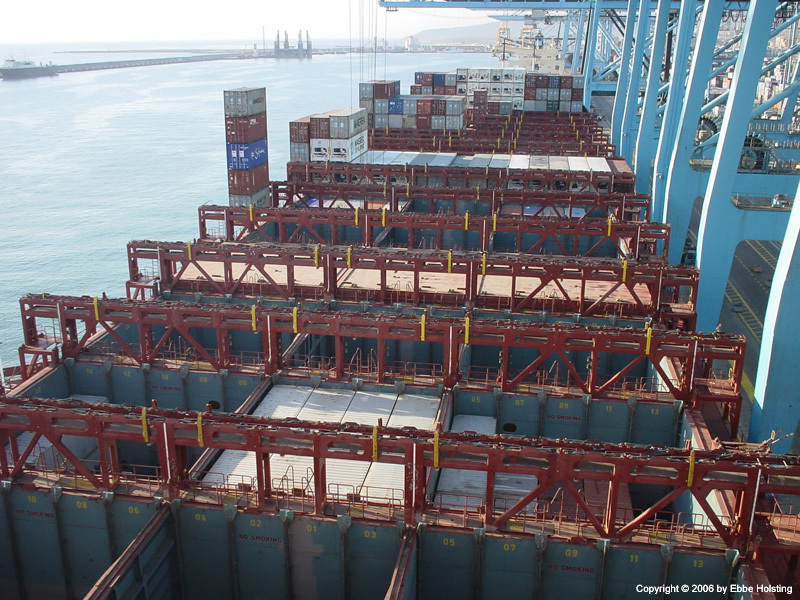 A cargo hold like this has a capacity of more than 100 40 foot containers! Looking from the bridge wing all the way down into the bottom of the cargo hold. A leap of more than 50 meters! As seen in the picture, the outmost row (row 13) in the cargo hold is not as deep as the other rows. This is due to the rounded edges of the hull. 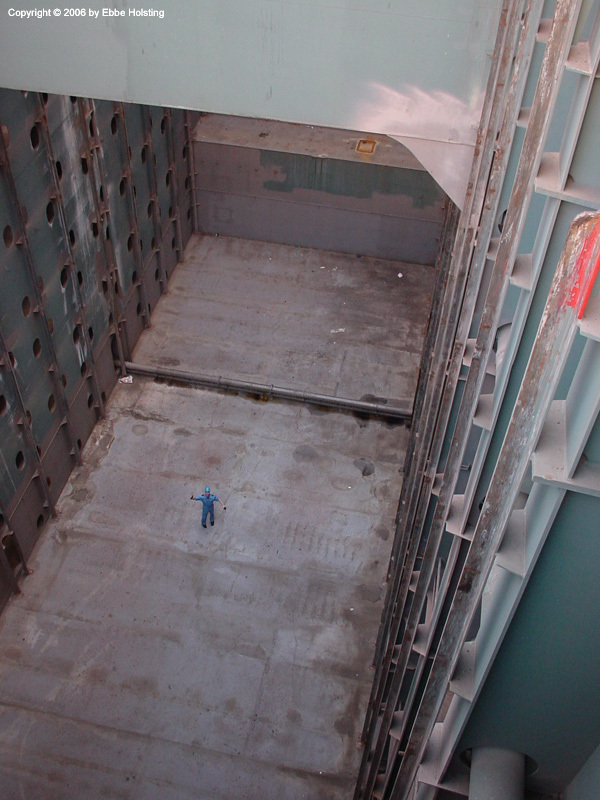 This empty excess space is a part of a ballast water tank. In this way almost not one single square foot of space goes to waste on container ships! Looking athwartships just aft of the accommodation. In the foreground to the left we see a power outlet for a reefer container. The reefer containers operate on a 440 volt alternating current. In this picture, though, the cargo bay is loaded with regular dry-weight containers. The forward side of the accommodation. Note the reefer bridges on the two lower decks, equipped with extractable platforms for maintenance access to reefer containers loaded just in front of the accommodation. 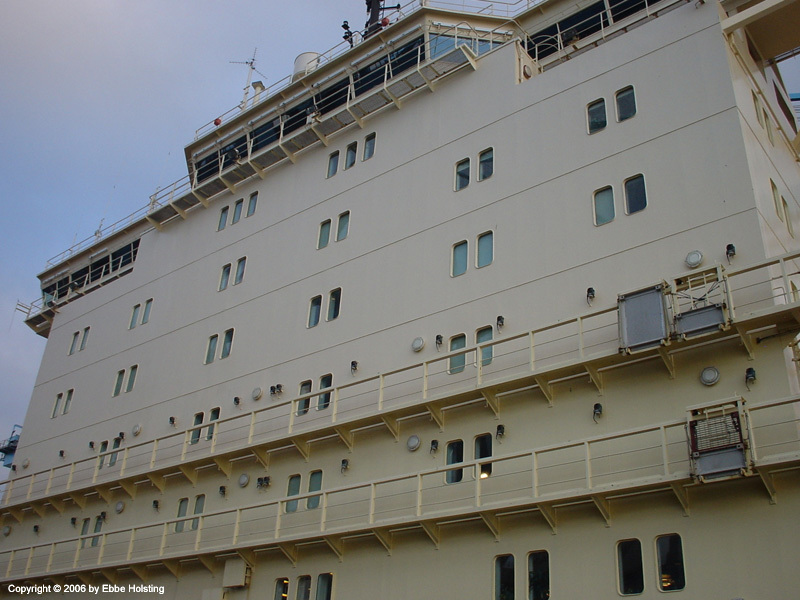 Most of the pairs of windows visible belong to individual cabins for the crew members. On the deck just below the wheelhouse, the three windows to the left belong to the Captain's quarters, and the three to the right belong to the Chief Engineer's quarters. Overlooking a completely empty deck aft of the accommodation. In the bottom left corner you can just make out the corner of the ship's swimming pool. This pool can be filled with sea water, a popular ability when the sea water temperature exceeds 30 degrees celsius. Starboard life boat in stowed position. Abandon-ship drills are held on a monthly basis in order to ensure that all crew members know what to do in case of an emergency. During such drills the boats aren't actually launched, but they are entered and the launch procedure is explained. However, the boats are launched onto the water surface once every three months in order to make sure they are always ready for use. A view inside the Engine Control Room. 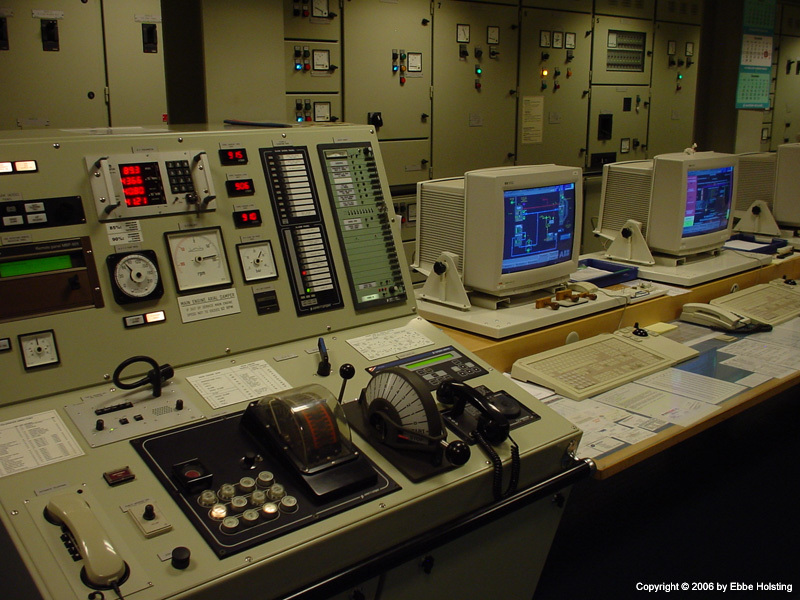 The two computers are a part of the engine room monitoring and alarm system. Onboard Svend Maersk and her sister vessels, this monitoring system is very advanced, enabling the engineers to control almost everything with the click of a mouse! 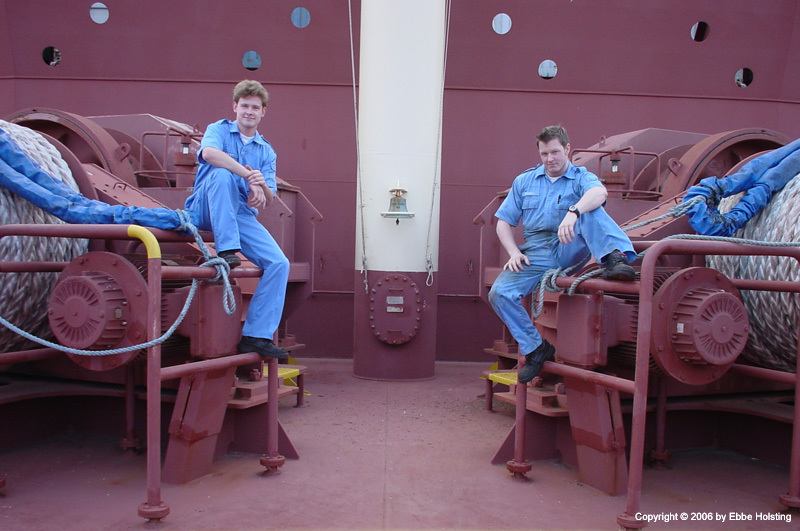 This being said, work in the engine room still includes hard manual labour and tough, as well as dangerous, working conditions. And that's it! Sailing time as a cadet is nearly over, this picture taken just a few days before we disembarked for one final year of schooling (me to the left).